Bladder cancer. Coloured X-ray of a large cancerous tumour (white) in a 62-year-old patient. Bladder cancer (urothelial cancer) is a fairly common type of cancer. Symptoms may include passing blood in the urine and a feeling of increased bladder pressure. The cancer can be surgically removed or destroyed with heat, but they frequently recur, and corrective operations are regularly needed. 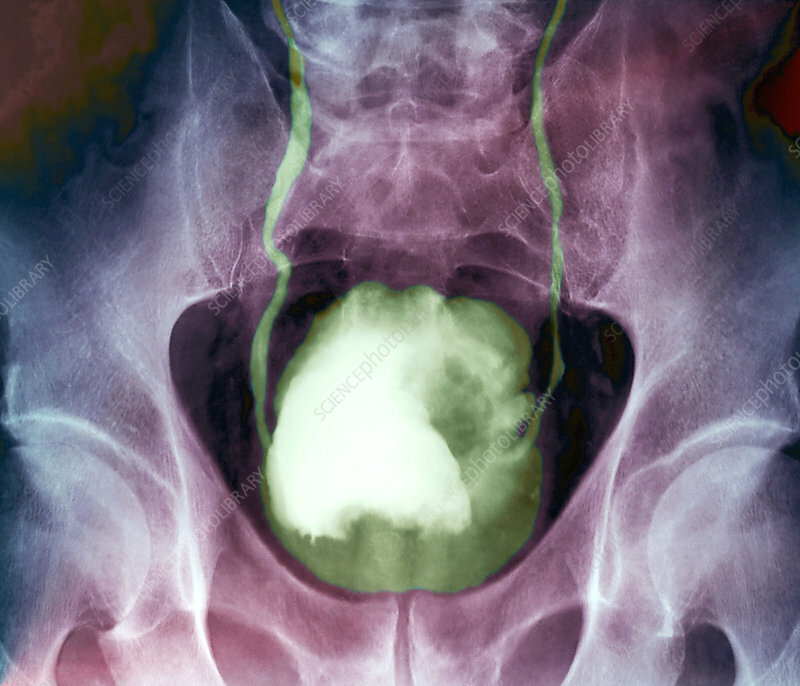 If the cancer is widespread, radiotherapy or even removal of the bladder (cystectomy) may be necessary. The prognosis for patients with tumours that are found early is good, but more advanced tumours result in a 10% survival rate over 5 years.